Week 1 of the NFL regular season was one for the ages: The double-digit underdog (+10) Buccaneers beat the Saints in a shootout on the road, the Packers overcame a 20-point deficit to win in the final minutes Sunday night and the traveling Jets (+7) withstood a first-play pick-six from rookie quarterback Sam Darnold to destroy the Lions, 48-17. And, of course, the Browns managed not to lose. Week 2 should be equally fantastic, with a teeming main slate on Sunday, Sept. 16, that kicks off at 1 p.m. ET. For analysis on the smaller slates, consult Chris Raybon’s premium strategy pieces (released throughout the week). In writing this piece, I’ve relied primarily on the FantasyLabs Models. This breakdown is less of a comprehensive analysis of each quarterback and more of an introduction to this week’s players via our large suite of analytic DFS Tools. 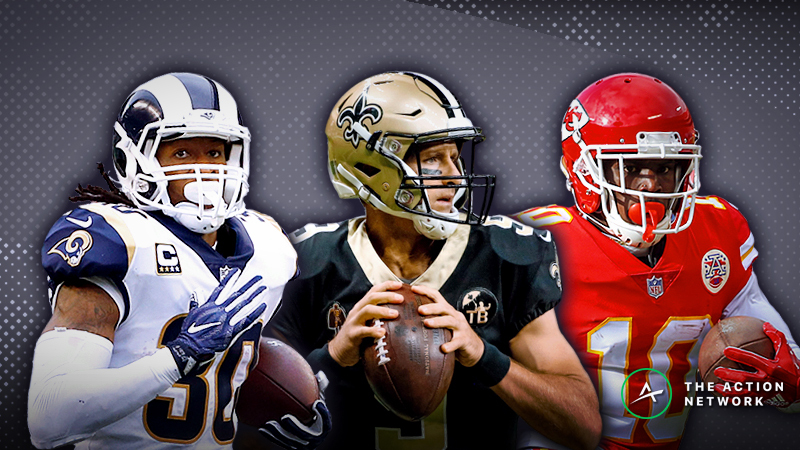 We’ll start with three high-priced quarterbacks, follow with three passers at the top of our individual Pro Models and finish with the rest of the slate’s starting quarterbacks. This week, quarterback pricing varies considerably site to site. For instance, the DraftKings QB2 and QB4 are salaried as the FanDuel QB6 and QB12. Likewise, the FanDuel QB3 and QB5 are the DraftKings QB6 and QB11. But there’s still some consensus: Both sites have three of the same quarterbacks priced in the top five. After attempting just 33.5 passes per game and throwing touchdowns on only 4.3% of his passes last season, Brees in Week 1 looked like his vintage self, completing 82.2% of his 45 attempts for 439 yards and three touchdowns (6.7% touchdown rate). With his 34.6 DraftKings points, Brees put up a monstrous +15.24 Plus/Minus. Any week, he has the potential to be the highest-scoring quarterback on the slate. Just as they were last week, the Saints are big home favorites, and that’s the exact situation in which Brees has thrived most throughout his career, especially since 2013. Brees has significant home/road and favorite/dog splits. After this week, the Saints will play at the Mercedes-Benz Superdome just once before November: If you’re looking to roster Brees at the Coors Field of fantasy football, there’s no time like the present. The Superdome has an A-graded 56-39-2 over/under record with Brees at quarterback. Even though the Browns were tough against the Steelers last week, holding them to 21 points in a 70-minute game and forcing six turnovers, the Saints still are likely to score points: Just last season, the Browns allowed the second-most points in the league (25.6 per game) and were 26th in pass defense with a 21.6% mark in Football Outsiders’ Defense-Adjusted Value Over Average (DVOA). 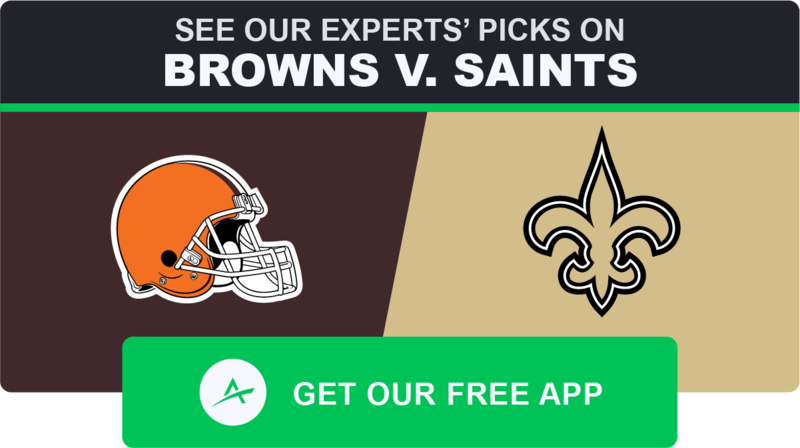 With the slate’s second-highest over/under, the Saints-Browns game could blow out. Brees will have a high ownership rate in guaranteed prize pools, but he still deserves starting consideration, given that he has the highest ceiling and median projections among all quarterbacks in our Models. When constructing tournament lineups, use our Lineup Builder to stack Brees with wide receiver Michael Thomas and maybe even running back Alvin Kamara. Since 2014, NFL quarterbacks on average have a 0.46 correlation with their No. 1 wide receivers and 0.21 with their No. 1 running backs. With Thomas and Kamara, Brees has obscene 0.77 and 0.54 correlation. Many DFS players avoid potential-heavy stacks because they worry about being too chalky. Don’t worry about that. 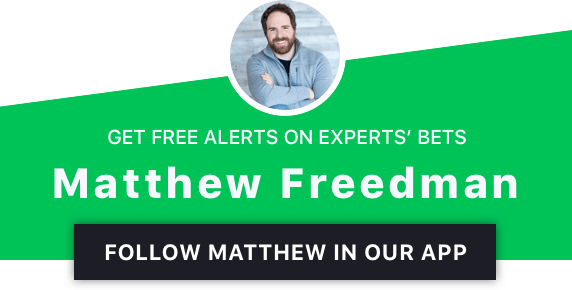 It’s usually easy enough to differentiate your lineup after you lock in your stack. Example: The Saints were heavily owned in the Week 1 DraftKings Millionaire Maker. Kamara was the most exposed player at 33.51%, and Brees and Thomas also had double-digit popularity (11.86% and 19.15%). However, the three of them were grouped together in just 2.83% of lineups — and when run back with opposing wide receiver Mike Evans, the Saints stack had just 0.09% ownership. When used with DeSean Jackson instead of Evans, that ownership rate dropped to 0.05%. That’s just 137 lineups, with five more spots left to create unique combinations. Again, don’t worry about being too chalky if you stack Brees with Thomas and Kamara. Sometimes the contrarian is the anti-contrarian. Brees is tied for the position lead with five Pro Trends on DraftKings, where he is the No. 1 quarterback in the SportsGeek and Freedman Models. UPDATE (9/16): Rodgers will reportedly (and as expected) start in Week 2. I believe him. Only twice in Rodgers’ 10 years as a starter have the Packers failed to make the playoffs: his first year as a full-time player, and last year, when he missed over half the season with a broken collarbone he suffered in Week 6 against the Vikings, who manhandled the NFC North on their way to a 13-3 record. The Vikings have only gotten stronger since then thanks to their quarterback upgrade. Rodgers knows the Packers can’t afford for him to miss Week 2. Rodgers will be limited, but I’d bet he’ll be active. One of the best quarterbacks of his generation, Rodgers has been productive even when injured. Like Brees, Rodgers tends to be his best as a home favorite, outperforming in that situation since becoming a starter. But Rodgers clearly carries risk. Not only is his injury a concern, but Rodgers’ matchup against the Vikings defense is daunting. During head coach Mike Zimmer’s tenure, the Vikings have held opposing quarterbacks to a league-low -2.33 DraftKings Plus/Minus and 27.7% Consistency Rating. Led by Harrison Smith, Pro Football Focus’ No. 1 safety last year (92.3 grade), the Vikings’ pass defense was fourth in 2017 with a -11.8% DVOA. Although the Packers have averaged 26.8 points per game in Rodgers’ six healthy starts against Zimmer’s Vikings, only once in those contests has he scored more than 20 DraftKings points. Newton had an uninspiring passing performance in Week 1 against the Cowboys with just 161 yards on 26 attempts, but in typical Cam fashion he led the Panthers with 13-58-1 rushing. With his career average of 39.8 rushing yards per game, Newton is second only to Michael Vick (42.7) among quarterbacks all-time, and he holds the NFL record with 55 rushing touchdowns. Even when he underwhelms as a passer, his elite rushing ability greatly limits his fantasy downside. But Newton is in a bad spot. His offensive line is in disarray: Left tackle Matt Kalil (knee) is on injured reserve, 2017 All-Pro left guard Andrew Norwell is now on the Jaguars, center Ryan Kalil had a 46.6 overall PFF grade last year, and right tackle Daryl Williams (knee) suffered a reportedly serious injury in Week 1 and is expected to have season-ending surgery. Not one of Newton’s offensive linemen starting this week had a PFF grade of even 70.0 last week. … so Newton has the potential to produce without his primary pass-catcher, but Olsen is superior to fourth-round rookie Ian Thomas. It’s suboptimal for Newton to be without Olsen, as he was for over half of last season, when running back Christian McCaffrey led the team in targets with 113. McCaffrey again led the team with a 36.0% target share in Week 1. With a passing game that runs through the backfield, Newton will have diminished fantasy upside. Finally, the difficulty of Newton’s matchup on the road against the Falcons might be underappreciated. They did just lose two Pro Bowlers for the season in middle linebacker Deion Jones (foot, IR) and strong safety Keanu Neal (knee, IR), but in head coach Dan Quinn’s 3+ years with the team, the Falcons have contained Newton, limiting him to just 16.9 DraftKings points per game (-3.62 Plus/Minus). On the road against the Falcons, Cam has been even worse, failing to hit salary-based expectations in all three games and averaging just 15.0 DraftKings points (-6.44 Plus/Minus). Given the circumstances, Newton is a GPP-only play. Besides Brees, there are three quarterbacks atop the individual Pro Models that Jonathan Bales, Peter Jennings (CSURAM88), Adam Levitan, Sean Koerner, Chris Raybon, Kevin McClelland (SportsGeek) and I have constructed. Road Roethlisberger reared his ugly, mulleted head in Week 1 against the Browns, as Big Ben “led” the Steelers to a 21-21 loss (you read that right), passing for 335 yards and a touchdown but scoring just 17.0 DraftKings points thanks to three interceptions and two lost fumbles. To be fair, the Browns-Steelers game had horrible weather (heavy rain, winds of 20+ miles per hour). In general, those conditions are bad for quarterbacks. It’s probably best not to read too much into Roethlisberger’s Week 1 performance. In fact, it cleanly fits into the career pattern of his poor home/road splits. Example: Since 2014 — even with All-Pro wide receiver Antonio Brown — Roethlisberger has been an abomination away from Heinz Field. In Week 2, though, the Steelers are in Pittsburgh, where Roethlisberger has historically gorged with a +6.85 DraftKings Plus/Minus and 73.1% Consistency Rating. Big Ben is hangry and ready to eat. Bringing the dessert to his home-cooked feast are the Chiefs, who last year were No. 30 overall with a 10.7% defensive DVOA and last week allowed 33.0 DraftKings points to Chargers quarterback Philip Rivers on 34-of-51 passing for 424 yards and three touchdowns. The Chefs are the cherry pie to be consumed. 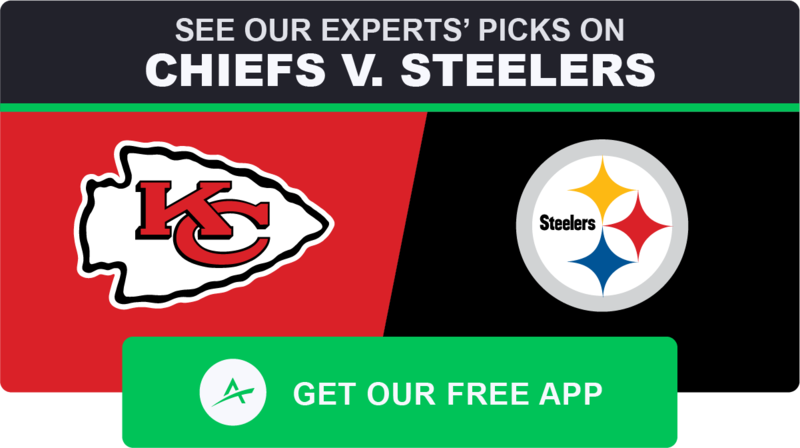 As mentioned on the midweek edition of The Action Network NFL Podcast, we’re high on the Steelers-Chiefs game in general and Roethlisberger in particular. He’s the No. 1 FanDuel quarterback in the CSURAM88, Koerner, SportsGeek and Freedman Models. Despite counterbalancing his two turnovers (one interception, one fumble) with an 8-40-0 rushing performance, Watson disappointed in Week 1 against the Patriots, completing just 50% of his 34 attempts for 176 yards and a touchdown. Against an improved Patriots defense, Watson was limited by PFF’s worst offensive line and the absence of playmaking No. 2 wide receiver Will Fuller (hamstring). On the plus side, though, Watson seems to have recovered satisfactorily from his season-ending knee injury last year. His dual-threat ability is largely intact. In Week 2, Watson should have a better performance. For one, Fuller is likely to return, given that he practiced last week and was a game-time decision. Additionally, Titans quarterback Marcus Mariota (elbow) is uncertain to play, which is why there are currently no Vegas lines for the game. If backup quarterback Blaine Gabbert starts, the Titans could struggle to sustain drives, resulting in more opportunities for the Texans’ offense. Finally, the Titans’ pass defense last year was ranked No. 24 with an 18.9% DVOA, and it might not be much better this year: In Week 1, the Titans allowed Dolphins quarterback Ryan Tannehill to complete 71.4% of his passes even though 17 of 28 attempts went to a trio of small backup-caliber wide receivers in Jakeem Grant, Albert Wilson and Danny Amendola. The Texans are familiar with new Titans head coach Mike Vrabel, who worked in Houston first as a linebackers coach and then as defensive coordinator before taking the job in Tennessee. The Texans should be able to implement a game plan that exploits the weaknesses in Vrabel’s scheme. As a rookie, Watson was basically the Michael Jordan of fantasy football, averaging 33.3 DraftKings per game in his four starts with wide receiver DeAndre Hopkins and Fuller. We should expect regression in 2018, but Watson has the highest quarterback floor projections in our Models and is tied with a position-high five Pro Trends on DraftKings, where he’s the No. 1 quarterback in the Bales, CSURAM88, Levitan, Koerner and Raybon Models. He’s also the top FanDuel passer in the Bales Model. UPDATE (9/16): Josh Gordon (hamstring) has been declared out for Week 2 and informed by the Browns that they intend to release him on Monday. Last week Taylor presented the best and worst of himself: In poor weather, he completed an embarrassing 37.5% of his 40 attempts for 197 yards and a touchdown, throwing an interception along the way, but he also had 77 yards and a touchdown on eight carries and finished with 24.6 DraftKings points, the slate’s seventh-highest total. Even when Taylor’s bad, he’s still usually good enough to use in fantasy thanks to his rushing prowess: Since becoming a starter in 2015, Taylor is second only to Newton with 291 carries, 1,652 yards and 15 touchdowns. In Week 2, Taylor plays in the closed environs of the Superdome, and he faces a Saints pass defense that last week vastly underperformed its 2017 No. 5 DVOA rating (-11.3%) and allowed journeyman Buccaneers quarterback Ryan Fitzpatrick to rack up 417 yards and four touchdowns passing with a 75% completion rate and a 12-36-1 rushing line. Not since 2015 has a quarterback scored more DraftKings points in a single game than Fitzpatrick’s 45.3 against the Saints. Taylor isn’t elite, but with his high-upside supporting cast — wide receivers Josh Gordon, Jarvis Landry and Antonio Callaway, pass-catching savant Duke Johnson and breakout tight end David Njoku — he has a real chance to finish as a top-three fantasy quarterback in what’s expected to be a shootout. No quarterback has more than Taylor’s two Pro Trends on FanDuel, where he’s the No. 1 passer in the Levitan and Raybon Models. Here’s a quick look at the remaining non-Model starters on the slate. Father faces a Bills defense that just allowed 47 points to an offense led by a lame-duck quarterback. The Jags held opposing quarterbacks to a league-low 10.4 fantasy points last year. Cousins funneled 50% of his Week 1 targets but 95.5% of his air yards to playmaking wide receivers Adam Thielen and Stefon Diggs. The quarterback for the No. 2 team in The Action Network Power Rankings now has multi-touchdown games in eight of nine regular-season starts since last year’s Week 8 bye. The shoulder withstood a league-high 53 pass attempts last week for 23.5 DraftKings points and a 73.6% completion rate. “Matt” just threw four interceptions as a home favorite but can redeem himself against a 49ers pass defense that last year allowed 19.8 DraftKings points per game to opposing quarterbacks (NFL’s third-highest mark). The gunslinger put up 28.3 DraftKings points against PFF’s No. 2 secondary in Week 1. Jimmy GQ struggled in Week 1 and still gifted 100+ air yards to a league-high three pass-catchers in wide receivers Pierre Garcon and Dante Pettis and tight end George Kittle. The FBS record-holder with 19,217 passing yards and 155 touchdowns got a 300-yard, multi-touchdown game in his first start with the offensive coordinator who play-called a Christian Ponder-led team to the playoffs in 2012. Offensive coordinator Steve Sarkisian has limited Ryan to one 300-yard, multi-touchdown game in 19 starts (including playoffs) after he had eight such games in 2016 with offensive coordinator Kyle Shanahan. Defensive coordinator Mike Smith’s unit has allowed a league-high 8,613 yards passing since he joined the Bucs in 2016. Mariota (elbow) is questionable to play and has missed at least one game in each year of his career. Fitz displayed a refreshing old-man DGAF attitude in Week 1 with a league-high 179 yards passing on five targets of 20+ yards. Carr has averaged just 10.6 DraftKings points per game (-5.74 Plus/Minus) in three high-altitude starts at Denver. Bortles “leads” the NFL with 65 interceptions since entering the league in 2014. The Dolphins are 8-5-1 against the spread with Tannehill as the starter and 7-10-2 with any other quarterback under head coach Adam Gase. The rookie won his NFL debut as the youngest starter in NFL history (21 years, 97 days). Bradford (of all non-Nathan Peterman quarterbacks) had a league-worst 7.6 Quarterback Rating under pressure in Week 1 (PFF). The future Hall-of-Famer has a league-best 0.0% interception rate. Be sure to read the other Week 2 positional breakdowns. NFL Preseason Fantasy Breakdown (Sat. 8/11): Cardinals WRs Have GPP-Winning Upside NFL Week 1 Fantasy QB Breakdown: Stack Tom Brady and Patriots vs. Texans NFL Week 1 Fantasy RB Breakdown: Play Alvin Kamara vs. Buccaneers NFL Week 2 Fantasy TE Breakdown: Is Jared Cook in Play vs. the Broncos?